Back in the summer it was a fun idea from Ariane Sherine in The Guardian, a Photoshop mockup, and a Pledgebank page. Then just before the pledge expired it started to get a bit big, with Matthew Parris writing about the effort to get ads on the buses in his column in The Times. So rather than things rest Ariane and I started to put in place a strategy for the relaunch of the campaign, now with the British Humanist Association on board. The result is the new AtheistCampaign.org website and a page for online donations. 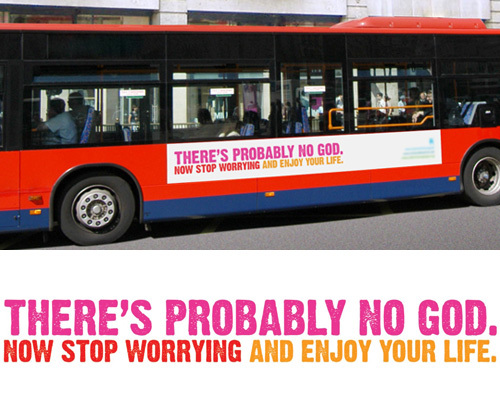 So if you like the idea of putting an atheist ad on the side of a London bus then please visit the site and donate! You can also support us on Facebook. It has been common among religious believers to look with misgiving to atheists and Gnostics, and to think that they are mistaken; however, in many instances the opposite is the truth; some religious beliefs are not just irrelevant, but baseless. The “God” of main line traditions simply does not exist. I accepted the challenge of finding the One who may be recognized even by Gnostics and atheists: the Existence itself, “All-That-Is.” If something is there, that is God. Look at the book “Christianity Reformed From ist Roots – A life centered in God” (Amazon.com). I am confident that some of your friends will be relieved of the illusion, as I did myself. “There’s probably no God, now stop worrying and enjoy your life”, and pray you’re not wrong. Its ok, Christian Voice have decided to save us all by complaining to the Advertising Standards Agency on the grounds that the organisers would not be able to factually prove that there “probably isn’t a God”. I don’t think that they will do too well. I wish such a bus came to Strasbourg! I advise non-profits on their online campaigning and this campaign demonstrates some good principles others can learn from. So – great initiative on PledgeBank (which I only became aware of after writing my post) and let’s see where this goes. is Â£22,178.81 much to the other Jon? I think, my friend, you have been proved wrong! You think people would donate enough for it to run?